WITH ALL THE ADVANCES IN MATERIALS, SOME PEOPLE ARE SURPRISED THAT DENTISTS STILL USE GOLD CROWN. 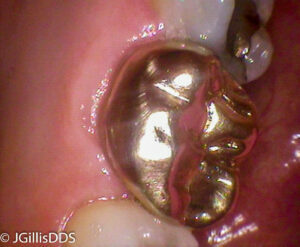 Beautiful gold crown on a back tooth! Gold has been used for over a century because it is a great material to restore defective portions of a tooth. Gold is very strong. Unlike porcelain, a gold crown cannot crack if you bite into something hard. 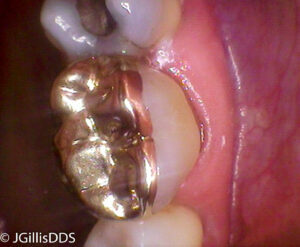 Preparing a tooth for a gold crown is very conservative compared to other crowns. Because gold crowns are very strong even when the gold is thin, your dentist can be very conservative in the amount of tooth that is removed. Sometimes with a porcelain crown, the porcelain must be thick (that means more of your tooth is cut away) to cover a dark or stained tooth. This is not true with gold. The dentist only has to remove the amount of tooth needed to provide strength and cover the weak areas of your tooth. Gold is gentle to the tooth that it chews against. This means that as you bite with your new gold crown, you are also hitting other teeth. Some porcelain crowns are so hard that they actually wear down the opposing tooth as you chew. All teeth wear with time, but gold has a similar hardness to your teeth so excess wear is minimized. back teeth are not often visible when you smile and that makes the perfect situation for a gold crown. Lets talk about biting. When you bring all your teeth together to bite into anything the forces increase as you go from the front teeth to the back teeth. So your posterior teeth or molars take the greatest forces when you are biting. 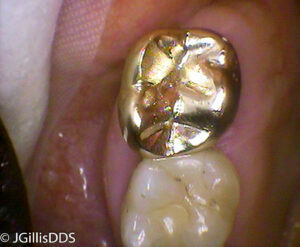 Gold does not chip or crack like porcelain can so gold crowns tend to last a very long time. is conserved by choosing a partial gold crown. This is the inside or tongue side of a tooth. because it was needed for strength. Gold crowns tend to burnish against your tooth over time. So, often they are still functional even when there is a small hole in the crown due to wear over time. Our office has been prescribing gold crowns especially for back teeth for about 30 years. We love the fit and wear and how conservative these crowns are. We also do not charge a surcharge for the use of this more expensive material. We also offer partial gold crowns and gold inlays and onlays. Please ask us if you have questions about what type of crown we would prescribe for you when you are seen in our office. 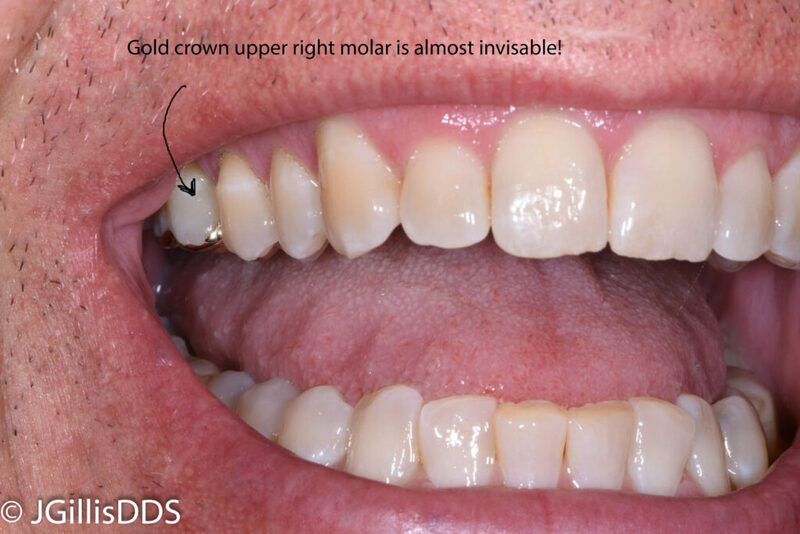 Even though this molar is visible in a full smile, a gold crown can be very conservative and what you mostly see is a beautiful tooth! Lets talk about cost. In our office we charge the same for a gold crown as a posterior porcelain crown even though the material is more expensive. We want you to have the best dentistry for your teeth and we want you to know and understand your options when it comes to restorations for your teeth. We also love porcelain crowns and sometimes this tooth colored material is the best option!